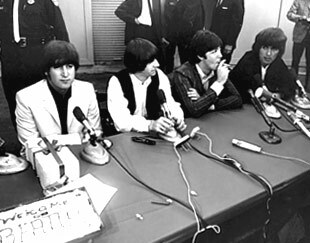 ABOUT THIS PRESS CONFERENCE: One likely reason that the Beatles always seemed to look forward to the California leg of their North American tours is that they often had time off to relax in the sun, and also to meet stars that they had idolized. On this tour, they had five days off in North Hollywood. It was during this time that The Beatles traveled to Mulholland Drive to meet Elvis Presley, whose early recordings had inspired them. 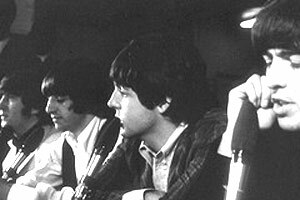 Beatles author Mark Lewisohn pinpoints their meeting with Presley as occuring in the late hours of August 27th. 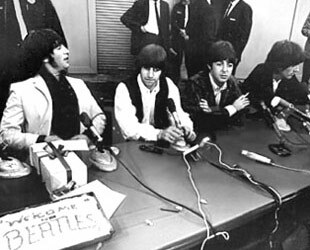 The next evening they performed at Balboa Stadium in San Diego, and gave the following press conference just before their concert. GEORGE: "We've done about six songs all together-- Country and Western."